With thousands of rescue groups and shelters across the country full, thousands die every year simply because we don’t have enough homes. Sadly, there is a presumption that rescue pets are in some way broken. This is simply not true. Most are abandoned at 4 weeks or surrendered by the owners for other reasons. Our aim is to not only rescue and re-home as many as we can but to also educate the public on how we can change the sufferings for thousands every year. Over the last four years the massive overpopulation problem has been a focus in animal welfare. We have come to understand if we build bigger and better shelters/systems the more we can intake; this is simply not true & more keep coming. 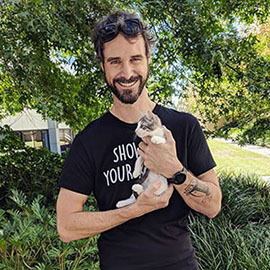 The importance of desexing has become a highlight and now many councils are introducing compulsory desexing laws and new regulations reducing how many dogs/cats breeders are allowed to breed per year. 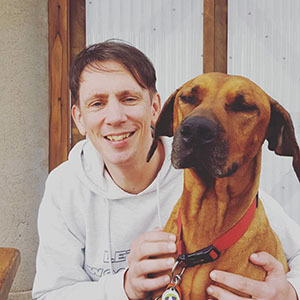 We aim to promote desexing as responsible pet owner ship and to work with vets are various other desexing networks to find more cost-effective ways for the public to desex their pets. Using free media outlets such as social media, we will & have become a voice for the voiceless. There are many reasons why a pet may be surrendered & each one could be different; however this doesn't help our current situation of over- crowding in pounds and shelters or over loaded shelters and rescue groups. How do we make it possible to Succeed? 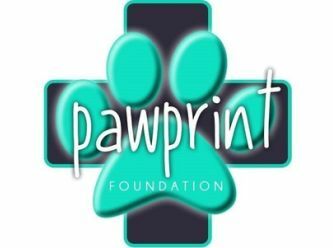 At PawPrint we have Sponsors and a very supportive public! Our sponsors help us with the big stuff! But the Public help us with everything else: Donations of food; blankets; toys; bedding; kitty litter; time for human interaction & dollar donations. Aussie Rooster Store at Kippa- Ring. They allow us to advertise; collect donations and educate the public of the importance of animal awareness; safety & over-crowding. We hope to drive animal welfare forward promoting a more humane future for our companion animals. Phoenix Trailers are also a major sponsor, who we are delighted to have on-board. Without foster carers we simply cannot operate. Foster carers are the lifesavers of every rescue group offering kind loving homes to those in need. Feeding pets in care can be expensive, so any food donations go a long way in helping us achieve our goals. These can be dropped off at either of our Aussie Rooster Store or to our office in Grice Street. Whatever your business or group, if you have a great fundraising event idea please contact us! Thanks for all at PawPrint! 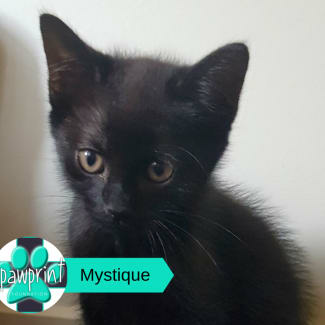 Mystique is a playful little adventurer. 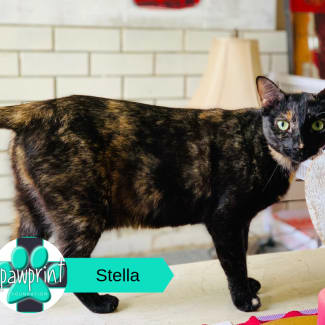 She loves to play, explore and get into mischief with her siblings. She is always exploring the world around her, she is very inquisitive. Mystique is still getting use to the resident dogs but we are confident she is bonding with them at her own pace. Mystique's beautiful black shiny coat and gorgeous eyes are sure to win you over. 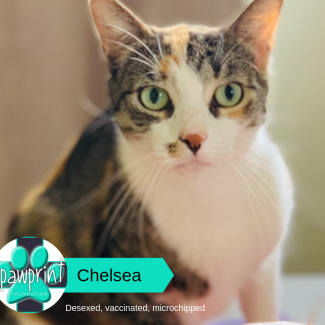 Once you meet this happy little kitten you'll want to take her home. Colour - Black Housing - Indoor Gender - Female Before being adopted, I will be: Desexed Vaccinated Vet Checked Microchipped Wormed & Flea Treated Litter Trained Good with dogs? YES getting used to them Good with cats? YES Good with children? YES Please note, kittens that are underage for vet work at the time of a meet and greet will not be available to take home until the vet work has been done. Kittens must be at least 12 weeks old, or weigh 1kg for surgery. 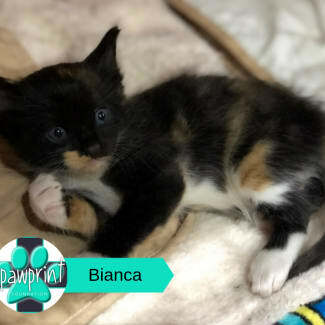 Adopters can apply for pre-approval for the adoption, however, depending on the age or weight of the kitten, adopters will have to wait until the kitten is ready for adoption. I love to have smooches, I'll help you get my dinner, I'll help you read, press buttons on your phone, love playing with the toys, climbing ladders, I am friendly with other cats. 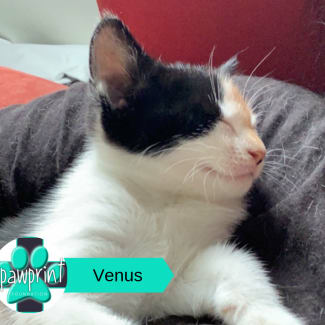 Colour - Tri colour Housing - Indoor only kitty Before being adopted, I will be: Desexed Vaccinated Vet Checked Microchipped Wormed & Flea Treated Litter Trained Good with dogs? Good with cats? Good with children?